There can definitely be some not-so-great things about music festivals, but that sort of charged, overcrowded atmosphere can also lead to some very cool things that really would never happen anywhere else. For example: At Bonnaroo last night, Kendrick Lamar and Chance The Rapper joined legendary funk act Earth, Wind & Fire on stage. Festivals are full of “surprise” collaborations, but this one really was a surprise, even to everyone involved. During the band’s late-night set, Earth, Wind & Fire bassist Verdine White saw Kendrick and Chano in the audience and invited them up to freestyle. “I knew who [Lamar] was, but it wasn’t planned,” White told USA Today afterwards. “We stayed up there — what — 90 minutes? We were only supposed to be up there 70 minutes. You know, you just go. You don’t think about it, you just keep going. He’s in the band right now.” Watch some footage of the collaboration below via Fake Shore Drive. 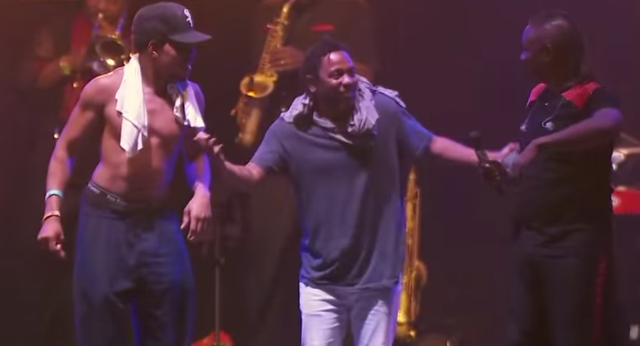 UPDATE: Footage of Earth, Wind & Fire’s entire set has now emerged online, and you can watch Chance and Kendrick come up at around 1:15:00.